I had been diligent in my training and nutrition leading up to the NYC Marathon, knowing that I was still recovering from the Berlin Marathon. The weather leading up to it was rather warm, but that changed the day before when the rains lingered for most of the day. Luckily it cleared up by Sunday, leaving colder weather and heavy winds. The temperatures in the mid-40s were optimal running conditions for me, but the winds led to a different story. For the first time, I started running the NYC Marathon on the lower level of the Verrazano Bridge, rather than on top in my prior two outings. I also was able to move up to the second wave for an even earlier 10:05am start. The winds were blowing up to 45 miles per hour as we attempted to make our way across the bridge. The winds not only made it colder, it threatened to knock over runners with each step. At times I could feel myself being pushed as I stepped, but I was fortunate to remain on my feet and not move into anyone else as Staten Island faded into the background. The Verrazano Bridge is a large elevation change to overcome so early in the race, but the distraction of the winds and the adrenaline of the race pushed me through those first two miles. Once we hit the streets of Brooklyn, the flat ground and building buffered winds were a reprieve from the early trials. I put myself into what felt like a good pace and looked down at me watch. I glanced down to see that it read I was doing an 8:30 mile pace, which was rather fast compared to prior performance, but felt ok, so I kept it going until the next hill at mile 8. The hill went up for about half a mile, but declined for about a mile and a half, continuing my strong run through the half marathon point at 13.1 miles. I was able to finish half the race with a time of 2:01:25, which felt great, but I knew the biggest challenges were ahead. 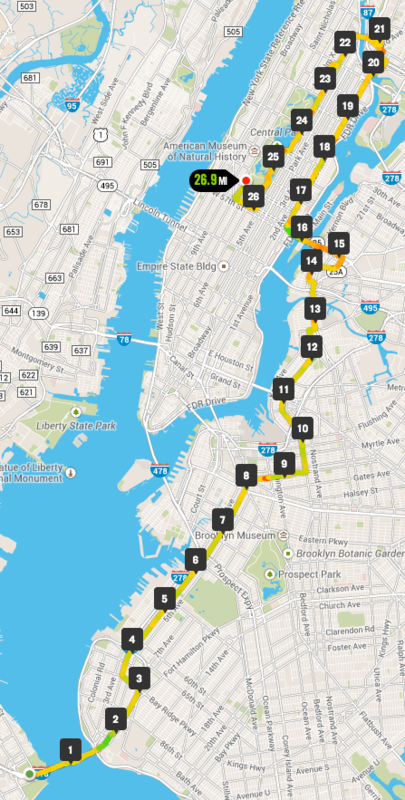 With a half the race done at a pace that could have given me a sub four hour finish on many courses, I surged onward to the Pulaski Bridge and Queens, the third of the boroughs I would be visiting. A two mile journey on the streets of Long Island City brought us closer to what is considered the toughest part of the course – the Queensboro Bridge. The highest elevation change – and highest elevation – of the course rising high over the East River and Roosevelt Island to the most exciting part of the race – 1st Avenue in Manhattan. The echo of the crowds can be heard before runners even lead the bridge, pushing them forward to meet the adoring friends, family, and fans packed in on both sides of the street to watch us run by. The onlookers helped take my mind off the gradual incline of the street as we continued uptown. I was still feeling strong, but I knew the hills were starting to take their toll on my legs as I worked my way up to the Bronx. The Willis Avenue Bridge led us to a short one mile loop in the Bronx before heading back to Manhattan via the Madison Avenue Bridge. While it is a straight run down Fifth Avenue from there to Central Park, a good portion is a rather long hill that takes its toll on many runners, including myself. It wasn’t until mile 24 where we finally turned into the park and continued south over the hills of East Side Drive that the race felt like the finish was slowly becoming approachable. Heading to the south end of Central Park and out onto the street to head west to Columbus Circle and back up into the park to run up West Drive to complete our journey at the finish line near Tavern on the Green, where the statue of Fred Lebow oversees the completion of our 26.2 mile run. 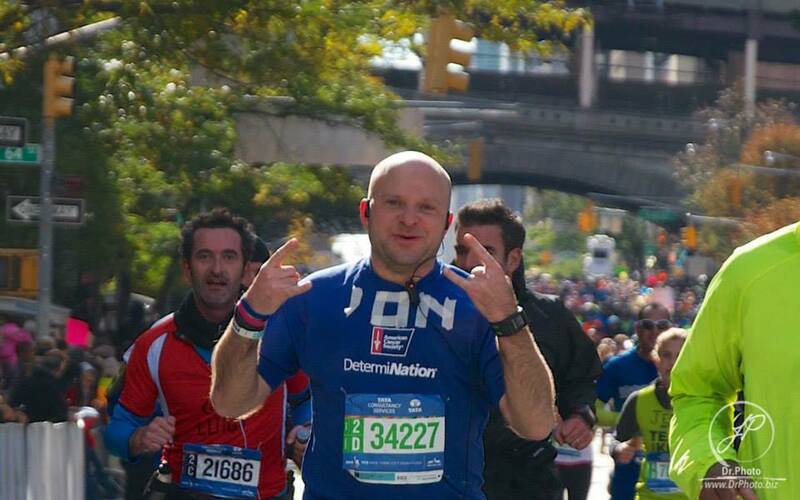 My final time for the TCS NYC Marathon was 4:18:00, which was about 30 minutes better than my previous NYC Marathon time, and about 2 minutes faster than my Berlin Marathon time, giving me a new PR. Although this is considered among the most grueling of the marathon courses, I was excited to have beaten all my previous times, including those on courses that are considered to be faster. With the race completed, my 2014 racing schedule is completed, and I can rest before returning to my feet to compete again in 2015.